So. There’s this little game. You might have heard of it: Facade. I came across it when researching writing and I was extremely interested in it. The download is free, which sometimes is a sign of poor quality. But, that isn’t the case here. This is a nifty game. 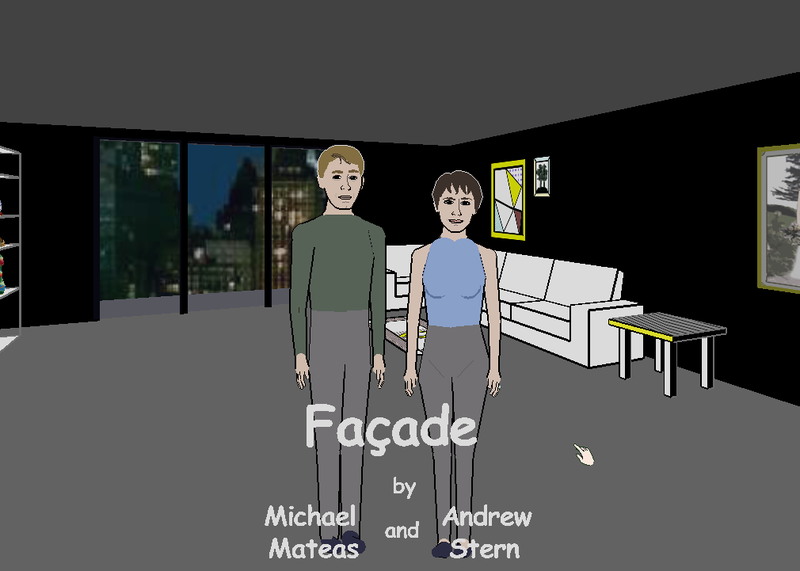 In fact, I feel Facade is a great experiment of what games could be. What is Facade? You play yourself. You’re an old friend of Grace and Tripp’s. They’ve invited you over for dinner. It’s been awhile since you’ve all visited. But, within seconds of getting through the door, Tripp and Grace seem to be fuming with one another. Your job is to either fix their marriage or tear them apart. How does the game work? Via the keyboard, you’re able to type what you want to say. Based on what you type, Grace and Tripp deliver prerecorded dialog that moves the story forward. The game is billed as an “interactive drama.” I’d go as far as to compare it to a lucid dream. I’ve only had a few lucid dreams in my life. These are dreams where you are aware you are dreaming and have some control over what’s going on. I relate the two because, in regular dreams, we simply watch our conversations with characters. In lucid dreams, we directly control the conversation. The game has a lot of replay value. I’ve played many times and in my last play through, Grace said something she never had before. (Tripp has a secret!) It was so astounding. I thought I had heard every piece of dialog, but I know now that I haven’t. You might be thinking, “Well, okay. But lot’s of game’s let you talk to characters…” Yes, that’s true. But, FACADE does it differently. Most role playing games allow you to speak to characters via dialog options. You could have three, maybe four pre-set questions you can ask a certain character. While you are picking which questions to ask, it somewhat feels limited. It doesn’t feel real. What makes Facade different is the allusion you’re controlling more than you are. We can type any word we want when talking to Grace and Tripp. While the questions are not directly posed to us, the story is moved by the prerecorded dialog. We feel like this is real because we can say or ask anything we want. Sure, we are limited by how many lines the actors can deliver and exactly what those lines are. But, there are hundreds of lines. We also feel more in control, because of how closnit the story is. We’re at someone’s house and the couple is fighting. In the context of being in this environment, we’ll say things that relate to marriage, answer questions they ask, and so on. We feel as though we can ask Grace and Tripp anything that pertains to them. And this is not something many games have. There are countless adventure games where you can roam around the environment freely. In that respect, we have games that make an environment seem real. But, role playing games still have aways to go where the characters seem real. This is where Facade succeeds greatly. I believe this game opens the door for other game designers. There needs to be more games where the characters are the focus and players truly feel that interaction with them is unlimited. The creators of Facade where creating a second game, THE PARTY. One could assume that the set up would be similar to Facade, but there would be more than two characters to interact with. But, as of 2013, it has been confirmed it’s no longer in production. That is truly saddening. As I said, I found this game through research on writing. Besides it being a “game”, it makes an excellent study on story, character and dialog. The story is tight. The characters are well-rounded. The dialog doesn’t come across as a written line, but as someone would actually speak. It’s something you need to experience to really understand. The game has been called an interactive play. So, why not take your shot at it? FACADE can be downloaded here. PETER PAN, LIVE! A Short and Sweet Review. This time last year, 18 million people sat down to their televisions to see Carrie Underwood in THE SOUND OF MUSIC, LIVE! 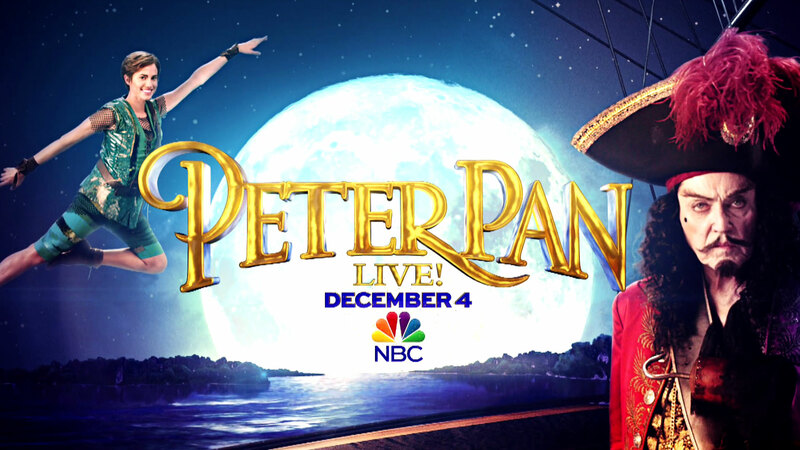 And, here we are again, but it’s PETER PAN, LIVE! With Allison Williams. I gave a quick review of the former production, so, I figured I could do the same this year. Short and sweet. My breath was taken away when Peter made his entrance. Flying effects were on point. Not a fault of the NBC production, but I felt most songs were forgettable. However, the music itself makes a great score. Allison Williams did a fairly good job, in both acting and singing. Christopher Walken seemed to go in and out of character. His Hook was silly. However, the Disney Hook is silly most of the time, so maybe that’s what he was going for. Taylor Louderman was an extremely melodramatic Wendy. Very Broadway. I would have liked her to tone it down just a tad during the few serious moments. Tinkerbell was nifty. Props to actors knowing where to look and for cameramen moving perfectly for Tink’s path. So, was this a better production than last years? I’d say it was. Not that “Music…” was bad, but you could agrue last year’s lead needed some acting classes. Sure, “Peter Pan” had sort of the same wonky feel. But, NBC fixed what went wrong last year and overall, I’d say this was very enjoyable and more whimsical. As it stands now, NBC is planning to air a LIVE play next year. I believe it will be 12 ANGRY MEN. My hope is they reconsider, and do another family friendly musical. While many people want to hatewatch, I think it’s important the LIVE Musical become a Holiday tradition. Might I recommend GREASE, CINDERELLA or THE WIZARD OF OZ?